On the southeastern side of the Peninsular Malaysia there is a group of 64 islands, of which Tioman Island is the biggest one (+/- 350 km2). Other known islands in this region are: Seri Bulat, Sembilang, Tulai, Sibu, Chebeh, Labas and Renggis. Tioman lies about 56 kilometers of the coast in the federal state of Pahang. Together with Perhentian Island and Redang Island, Tioman is the most popular island on the eastern side of the peninsula. The island is especially known for its wonderful diving and snorkeling possibilities. There are many resorts on the island, catering for every type of traveler. Tioman is a duty-free island, which means some items are much cheaper compared to prices at the mainland. This especially goes for alcohol; which is clearly cheaper compared to other tropical island (only a few ringgits for a beer or cocktail). Around the villages of Tekek and Salang you will be able to find some nightlife; as there are numerous nice bars. Overall the island has a very tranquil atmosphere. The inland of Tioman is covered in thick jungle; the edges of the island are populated. Because Tioman is part of a Marine Park, all visitors have to pay a marine park entrance fee of RM5 upon arrival. "A legend synonymous with the island is the tale of a beautiful dragon princess. On her way from China to visit her prince in Singapore, this fabled maiden stopped to seek solace in the crystal-clear water of the South China Sea. Enchanted by the charms of the place, she decided to discontinue her journey. The princess took the form of an island and pledged to offer shelter and comfort to passing travelers." Tioman is well known as a diving and snorkeling paradise, just like Redang and Perhentian in the north of Peninsular Malaysia. Usually you pay around RM90 for each dive (this includes use of equipment and such). You can get your Open Water license (PADI) here for around RM1000, but know that for this you need to stay at least 5 days on the island. There are numerous dive schools; we heard great things (and in some cases have great experiences) about DiveAsia (5 Star IDC), B&J Dive Center, Tioman Dive Centre and Fisherman Divers. Check out the nice video below to get an impression of the dive sites around Tioman Island. Non-divers can enjoy a bit of snorkeling at one of the many snorkeling sites around the island. Most resorts have a house reef; where you can snorkel right in front of your cabana. Make sure you check this if you are making reservations beforehand. Many resorts also offer snorkeling tours to secluded areas around Tioman or to uninhabited islands in the vicinity of Tioman (for example Tulai Island and Renggis Island). Snorkeling equipment can be rented at most of the dive shops and also at many resorts. It is not that common anymore to get fins as too many tourists decided to stand on the precious corals. Also, some require you to wear a life vest which forces you to stay above water at all times (again to conserve the coral reefs). Some great places to snorkel around Tioman are: Paya, Tekek and Ayer Batang. Tioman is popular among those that like fishing. Deep-sea fishing trips can be arranged at many places on the island. Do know that as fishing is prohibited within the marine park; you may only fish at least 25 km from the coast. There are almost no roads on Tioman; but there are quite a few jungle tracks. These are perfect for light jungle treks. Two popular treks are from Tekek to Juara (2hrs) and from Tekek all the way to Monkey Bay. Great beaches are: Genting Beach, Tekek Beach and Salang Beach. At these beaches there are aquatic sports operators (kayaking, surfing, wakeboarding and jet skiing). Tioman has many nice waterfalls that you can visit. Some are easily accessible, others require a light trek or a short boat ride. One of the most popular waterfalls on Tioman Island is the Mukut Waterfall; especially during weekends locals hang out here to relax with their friends or families. Don't forget to bring a towel and swim shorts/bathing suit. Another beautiful waterfall is the Asah Waterfall; the biggest waterfall in Tioman Island and located about 6 kilometers from Mukut Village. You can get there by either doing a 45 minute trek or by arranging a boat trip. Golf enthusiasts will be happy to know that Berjaya Tioman Resort has an 18 hole golf course. Tioman has quite a number of beautiful resorts, some are very luxurious and therefore expensive; other resorts are basic and very affordable. The most luxurious and exclusive resort on the island is the 5 star JapaMala Resort . This is rated as one of the best boutique resorts in the world and it is especially great for honeymooners. Another very nice place to stay is Bagus Place Retreat; you pay RM850 per night which is certainly not cheap but this is including all meals and many other things. This is such a popular place that it is fully booked almost every year (making reservations a year in advance is not a weird thing at this popular place). Another little gem, Bersatu Nipah Chalet, can be found at Nipah Beach; where you can stay in an air-conditioned chalet for RM90 per night. Another popular place is the Melina Beach Resort. You will find most backpacker accommodation at the northern parts of the island. Bookings must be made in advance or else you may end up sleeping on the beach. 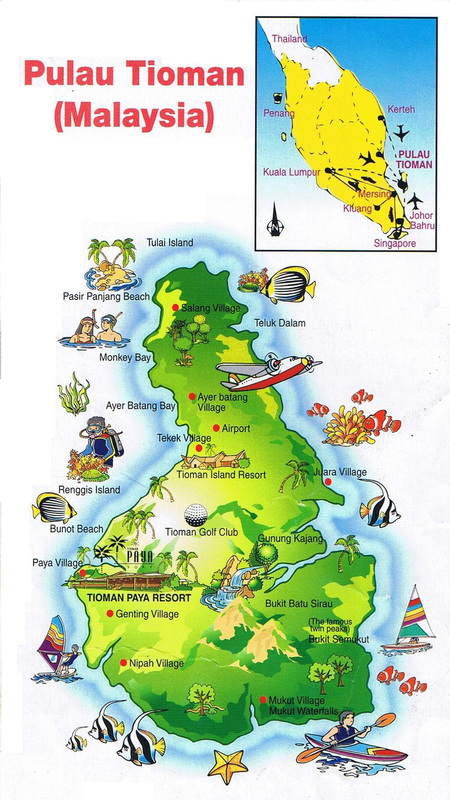 Below a list with some of the resorts on Tioman Island (view all hotels and resorts at Tioman here in a new page). The best time to visit Tioman is between March and October. The northeast monsoon transforms this tropical gem into a desolated place between the end of October and the beginning of March; many resorts are closed during this period. Because of this monsoon the underwater world is a lot less beautiful; visibility is bad and there are currents so diving and snorkeling is not possible. Avoid the island during school holidays and public holidays; especially Singaporean school and public holidays as the island is very popular among citizens of Singapore. If you visit Tioman between April and October you will still have a chance that it rains; you are, of course, visiting a country with a tropical climate. Do check up front if the resort has a reef in front of the resort; it is just so much more fun if you can snorkel right in front of your cabana. When traveling by boat from Mersing to Tioman, operator Bluewater Express charges the same price so there is no point in waiting with the reservations (so you can include this with your resort booking if the resort asks for this). Make sure you arrive at Mersing jetty (or Tanjung Gemuk jetty) well before 4pm (last boat to Tioman departs around 4.30pm). Try to avoid the last vessel as it is always the busiest. Last boat from Tioman to the mainland departs at 4.30pm daily though the ferry schedule can be affected by weather and tide. If you are going to do some diving or snorkeling; you will need diving goggles. If you are wearing glasses it would be great to have powered lenses in your mask, but unfortunately almost none of the diving schools at Tioman have those. Luckily you can buy them beforehand at the Midvalley Megamall dive shop in Kuala Lumpur for only RM179. They are ready made, so you only need to find out the needed correction (just drop by a store where they sell glasses and have it measured for free). There are ATMs available on the island but make sure you bring along enough cash and a credit card as your resort might not be located nearby one. There also are ATM's at Mersing Jetty. Cell phone coverage (3G) should be ok at Tioman. If you bring along a local sim it should work fine though you might stay at a resort where coverage is not that great. Not every resort offers WIFI internet. Sometimes they do offer internet, but you pay dearly. Best is to buy a local sim card with 3G support and use this with your smart phone. Another option is to buy a monthly prepaid subscription to a mobile internet provider at one of the shops in Kuala Lumpur (works with an usb dongle). Some resorts do not have secured booking options integrated into their website. They will ask you to send over your credit card details by email of fax machine. Check your credit card company up front whether they offer guarantees in case something goes wrong when you are making reservations in advance. Always ask if payment via PayPal is an option (as then there will be a third trusted party involved). The best and cheapest way of hopping from one village to the other is to use the Mersing/Tioman Bluewater Express ferry service. They charge around RM15 per trip which makes it a reliable, easy and affordable way to explore parts of the island by boat. As this service only operates between Salang in the north and Genting in the south you will have to use local boat operators to get to other places on the island. These trips can be quite expensive; but the only alternative is to go on foot to the other villages. There are 4x4 cars that drive to certain places on the island, but this method of transport is also very expensive. 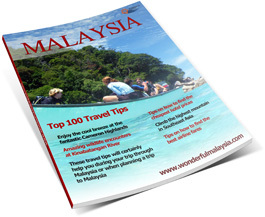 There are 2 ways to go to Tioman Island, over land and across the sea, or through the air. The cheapest solution is to take the bus, tickets cost around RM30. Buses drive from Kuala Lumpur to the fisherman's village Mersing in about 5 hours; from there the ferry, operated by Bluewater Express, leaves to Tioman or to one of the neighboring islands within this group. A lot of tourists that visit Tioman are from Singapore; they travel directly from Singapore to Mersing by bus, this trip takes about 3,5 hours. If you are booking a package stay on Tioman, a return ferry transfer is usually included. The second option to get to Tioman Island is by direct flight from Kuala Lumpur's Subang Airport or Singapore Changi Airport to Pulau Tioman Airport (nearby the town of Tekek). Berjaya Air (part of the luxurious Berjaya Resorts Group) takes you with its private jet to Tioman. During peak season there are daily flights. The flight from Kuala Lumpur takes about one hour. This direct flight is the quickest way to get to Tioman, but it is definitely the most expensive way to get to the island (over RM700 for a return flight).